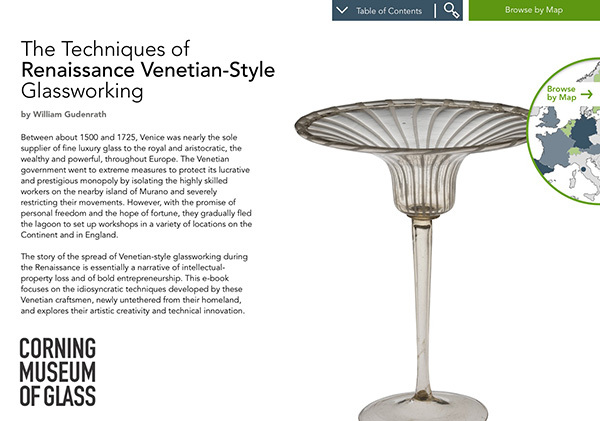 These late 17th-century Venetian dragon goblets are made in four stages. First, the cup is made. A small amount of glass is gathered on the end of a blowpipe and rolled back and forth on the metal table, called the marver, to make the glass perfectly concentric with the blowpipe. Air is blown into the pipe, and a bubble forms. The tip is gently rubbed against the cold table to cool the glass. After reheating, air is blown in the pipe, and tooling begins to shape the cup. A constriction has begun between the vessel body and the blowpipe. The glass is inflated and pulled outward to make the bubble slightly taller than it is round. Excess glass is trimmed from the tip. And after reheating, the lower portion of the bowl or cup of the goblet is given its shape. A small amount of glass is gathered on the end of a metal rod, placed on the tip of the bowl, and tooled to become a merese or disk. A decorative knop is made. A small amount of glass is gathered on another blowpipe, inflated, and lowered into a dip mold. This creates ribs, and after further inflating the glass, the bubble is lowered onto the tip of the merese and cut free of the blowpipe. Decorative constrictions are made, and the excess glass is trimmed free. A small amount of glass is added and flattened to form a cap, or smooth decorative cover. After this hardens, the bubble is transferred onto the punty (or pontil). The neck is broken, and the opening reheated. The edge of goblets of this period are exceedingly thin, and a special lip-thinning procedure is used. A flare is made. Excess glass is pulled out very thin, a constriction is made, and the glass that was once thick, broken away. The glass is reheated, and alternately using the jacks and the soffietta, the vessel is given its final shape. Because the glass is so thin, it must be reheated frequently. Thin glass loses its heat very rapidly. The cup is placed on hold in an annealing oven that is held at a temperature of about 950 degrees Fahrenheit. The foot begins with a small bubble of glass lowered into the dip mold and tooled to become a decorative knop. Excess glass is broken free. A merese is made. An additional gather is added, and this is tooled to form an avolio, a small spoollike construction. It is to the tip of this avolio that the blown foot will be added. The foot is yet another bubble of glass lowered in place, trimmed free of its blowpipe, and a constriction formed. This will allow a hole to be created. The edge of the hole will become the edge of the foot. After reheating, a combination of tooling with the jacks and inflating with the soffietta is used to give the foot its final shape. The foot assembly is broken free of its blowpipe and placed on hold in the annealing oven. The body of the dragon is decorated with a blue cane and a red cane. These are attached to a thick bubble, reheated, and marvered smooth. And during marvering, blowing continues. This is thinly overlaid with another gather of clear glass. Excess glass is trimmed free, and the bubble is lowered into a dip mold and blown hard. This creates the ribs. 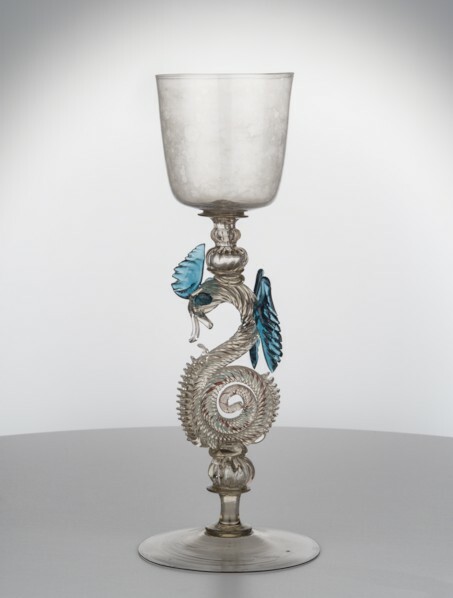 The glass is elongated by pulling outward, and the body of the dragon is formed. To enable the dragon body to be separated from its blowpipe, a constriction is made, excess glass is trimmed from the tail, and after reheating, the coiled body begins to be formed. A small pad is added; eventually the foot will be connected to this. A punty is attached to allow the dragon completion to take place. And after reheating, the body is given its final shape. Decorative bits of glass are added to the front and back, cast free of the gathering rod, and tooled to form a denticulate pattern. The beak is formed. The glass is divided into two halves, pressed flat, pincered, and pulled outward to form the upper and lower lips. Tiny amounts of aqua glass are added for the eyes, similarly for the wings, and then tooled to form the winglike shape. A comb is added to the head. The dragon is reheated repeatedly to get it slightly soft, and final adjustments are made for the shape. This is broken free of its punty and put on hold in the annealing oven. The foot is attached to the punty, a small amount of glass added. This will be used as a glue bit to pick up the dragon. A second glue bit is added to the head of the dragon and used to attach the bowl.